We are very grateful to our sponsor, GTE Financial, for continuing to provide lunch at our MacDill Air Force Base LinkedIN Workshops for 4 straight years! GTE recently celebrated their 84th Anniversary of serving the financial needs of local residents and businesses, as well as enriching the Tampa Bay community. They are a not-for-profit financial cooperative and have been able to help multiple charity organizations and its members year-round. Giving back to the community is important to GTE and is embedded in its culture. Our January 2019 LinkedIN Workshop on MacDill Air Force Base kicked off the sixth year Project Transition USA has been invited to teach LinkedIN workshops for active duty transitioning servicemembers & families on base. Why LinkedIN? 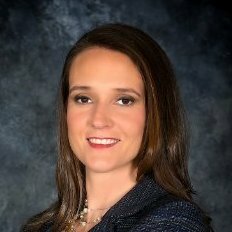 Forming strategic relationships and building a professional network is critically important in the military-to-civilian transition process, and LinkedIN has long been the #1 resource in that realm. Our next LinkedIN Job Search Workshop on MacDill AFB is scheduled for Friday, April 19th, 2019, and it is open exclusively to transitioning military personnel and dependents who are enrolled in MacDill’s TAP program. GTE Financial is a not-for-profit financial cooperative with more than $2 billion in assets and 24 Community Financial Centers located throughout West Central Florida. Chartered in 1935, GTE Financial is locally owned and operated in the Tampa Bay area, serving more than 240,000 individuals and businesses. We invite you to show your support for our transitioning troops and their families by joining our Project Transition USA group and offering your support! To learn more about Project Transition USA’s LinkedIn Job Search Workshops on MacDill AFB, visit www.ProjectTransitionUSA.org. You need to hear the INSIDE SCOOP — and reaching out to those folks can make a HUGE difference! Why would they choose to help YOU? Because you’ve built a RELATIONSHIP with them in advance (usually on LinkedIN) based on common INTERESTS and PASSIONS. So it’s VERY important that you add those things to your profile. Make it EASY for them to find what they have in COMMON with you! And BEFORE asking for help — do a TON of research about that role and company (and entire INDUSTRY). Don’t waste their time on things you should have KNOWN. Something I hear from recruiters all the time is WAY too many job seekers aren’t even CLOSE to being prepared when they APPLY, let alone when they INTERVIEW. And remember this. Recruiters LOVE it when you’re personally REFERRED by someone who already works there. So don’t be afraid to reach out and ask for help. Just do it in the RIGHT WAY. Take the time to learn how to REALLY use LinkedIN! The WORLD becomes a brighter place after learning the ART OF CONNECTING! Attention all transitioning U.S. Veterans! If you haven’t yet applied for a Fortune 500 mentor with American Corporate Partners (ACP), do it NOW — before it’s too LATE! After speaking with ACP staff members Bernard Agrest, Robert Rahni, and Timothy Cochrane, I’m even MORE confident this opportunity is too good to miss!! * ACP is a non-profit organization that pairs post-9/11 veterans with mentors from EVERY industry in the civilian world to work one-on-one for a FULL YEAR of career & professional development mentoring. * They work with you to identify your career GOALS and INTERESTS, then assign you a mentor from a FORTUNE 500 company (or small business via the ACP Citizens Program) to work on developing the SKILLS you need to be successful in corporate America. * Mentorships are custom-tailored to YOUR goals, and are as FLEXIBLE as needed. * Along the way, ACP staff will stay in touch, suggesting additional DISCUSSION TOPICS, and making SURE you’re headed for success. This is an AMAZING opportunity for any post-9/11 transitioning vet — it’s absolutely FREE — and you’ll get a FORTUNE 500 mentor for a whole YEAR! Don’t wait! Apply now on ACP’s website, OR directly at https://lnkd.in/eqFparA! We are very grateful to Ben Sever, VP of Strategic Partnerships at AtRock Consulting Group, for personally helping us create and fund the first round of our new Veteran Scholarship Program at Project Transition USA. 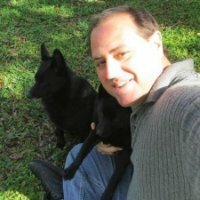 Ben’s generous financial donation is allowing us to begin offering a pro bono, one-on-one LinkedIN coaching service in addition to the monthly LinkedIn workshops we’ve been facilitating for transitioning military personnel and their dependents on MacDill Air Force Base (home of U.S Central Command and Special Operations Command) since 2012. BOTTOM LINE: This program is aimed at keeping MORE of our transitioning servicemembers here in Tampa Bay so they won’t need to relocate to find jobs! 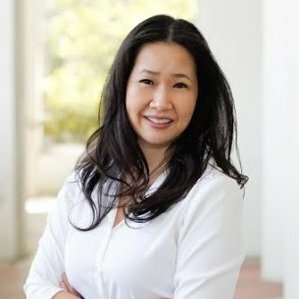 Project Transition USA’s pioneering effort has already yielded widespread success stories from start-up job offers to employment with Fortune 500 companies such as Tesla and Amazon. The addition of this new Veteran Scholarship Program will bring us closer to our goal of insuring that transitioning military servicemembers feel thoroughly equipped to make the significant cultural switch to the civilian workforce. 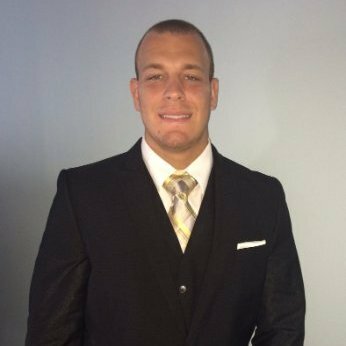 Ben Sever is proud to be a longtime Tampa resident, and in 2017 he quickly rose from becoming a monthly volunteer at our LinkedIn workshops on MacDill AFB, to accepting an active position on Project Transition USA’s Advisory Board. He recently shared this story. In addition to philanthropic work, Ben recently started his own consulting company that has already acquired a nationwide client-base. He is also an avid supporter of his hometown’s economic development, so he’s serving on the 2018 Ambassador Committee for the Greater Tampa Chamber of Commerce. Our next LinkedIn Job Search Workshop on MacDill AFB is scheduled for Friday, January 19th, and is open exclusively to transitioning military personnel enrolled in MacDill’s TAP program, their dependents, and Project Transition USA volunteers. Ben has also facilitated the introduction of this month’s guest speaker, Kevin Plummer, Tampa Preparatory School’s Headmaster (Ben’s alma mater), due to Kevin’s enthusiasm for technology tools like LinkedIn, as well as his veteran advocacy and strong belief in Tampa’s booming culture. Project Transition USA is the only 501c3 nonprofit that specializes in teaching transitioning U.S. military veterans and their families how to fully utilize LinkedIn — the world’s most powerful business networking site. For information about sponsorship opportunities with our new Veteran Scholarship Program, please call Nancy Laine at (727) 415-3878 or send an email to nancy@ProjectTransitionUSA.org. A special thank you to Grier Holliday for donating Project Transition USA’s website hosting these past 5 years! We are very fortunate that our longtime sponsor Grier Holliday is a humanitarian and the grandson of two decorated Military Veterans — U.S. Navy & U.S. Air Force. He’s a true descendant of the legendary “Doc Holliday”, and his father actually goes by “Doc” Holliday”! We are sincerely grateful for Grier Holliday’s dedication and support! Congratulations to USAF Col. (Ret) Glenn Nielsen for winning a 2017 HEROES AT WORK AWARD! Glenn Nielsen, our treasured volunteer photographer, is being honored with a 2017 HEROES AT WORK AWARD by the Tampa Bay Business Journal! The Tampa Bay Business Journal’s Heroes at Work award recognizes Tampa Bay veterans who, through their professional and personal efforts, are making a positive impact throughout the community. USAF Col. (Ret) Glenn Nielsen is a decorated combat pilot who has been volunteering his time and expertise as a profile headshot photographer at our LinkedIN Workshops for transitioning servicemembers and their families on MacDill AFB for over a year now. Glenn is one of the most talented, multi-faceted individuals I’ve ever had the pleasure of knowing. “Creative” would be an understatement….every month he magically transforms a military supply closet into a portrait studio(!) — and the quality of photos he produces under these circumstances is beyond amazing. He is an absolute lifesaver to our transitioning military attendees since a professional profile photo is often critical to their future career success. In the past year alone, he has positively changed the lives of HUNDREDS of his fellow veterans! 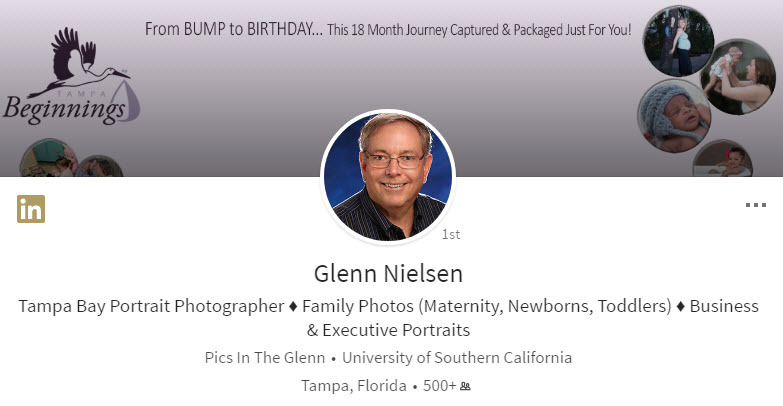 In his professional life, Glenn is a sought-after Tampa Bay portrait photographer. He’s a Godsend to families seeking a keepsake family portrait, as well as expectant mothers and families with newborn babies or developing children. Glenn simply loves PEOPLE (even little people! ), and there’s nothing that gives him greater pleasure than capturing the look of love between a parent and their child. Our heartiest congratulations go out to Glenn Nielsen for receiving this prestigious award in recognition of his excellence and extreme generosity! !